An 18-year-old cancer survivor from Lincoln is to lead an army of fundraisers at the Lincolnshire Showground Race For Life this weekend, and she’s urging others to join her on the front line. Natasha Anastasiou will be speaking on stage and setting the runners off at this year’s race, which takes place on Sunday, June 12. The brave teen is sharing her story to encourage families, mums, daughters, sisters and friends to help swell the Race for Life ranks by signing up online. Natasha said: “I’m teaming up with my family to take part this year. Last year we raised £3,000 for research. Natasha was diagnosed with Stage 2 Hodgkin Lymphoma when she was studying for her A Levels in March 2015. She noticed a lump on her collarbone and went to see her GP. 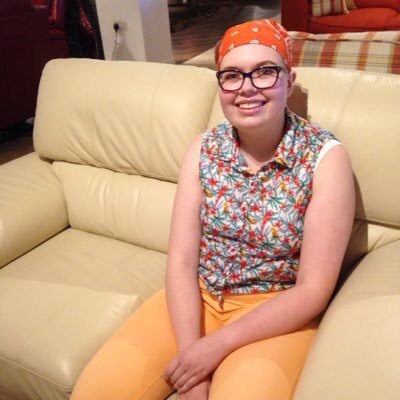 When antibiotics failed to help, Natasha was referred for a biopsy and scans. Natasha added: “I saw the scans and thought, it’s bad. There was one lump on the right and two on the left, they’d continued to grow. They were massive black spaces, dark ovals, massive in comparison to everything else. “My parents told me the news. There’s a saying, they smile at you because something is wrong. It sums it up! I was in bed, not feeling great, and they came in. They smiled at me and I knew it was bad news. When they said it was cancer, I was upset but I wasn’t shocked. “For my treatment it was like living in a bubble. I decided I didn’t want to see people, I just wanted to get on with it. “I was like a child again, it was really frustrating. I couldn’t do simple things like get dressed, or up out of the chair. After chemotherapy Natasha started a course of radiotherapy as well. Her treatment finished in September 2015 and she was found to be in remission in the November. “I’m getting better but I’m shocked at how slowly it’s taking”, she admitted. “If I stop and think back and remember how bad I was, I’ve come a long way. Last year, Natasha completed the race in a wheelchair. This year, she’s walking it. “The steroids made me put weight on, eight stone in six months. I was always healthy before but it is coming off again. Cancer Research UK’s Race for Life, in partnership with Tesco, is a women-only series of 5k, 10k and Pretty Muddy events which raises millions of pounds every year to help fund life-saving research. At the Lincolnshire Showground there are three events this year – a new Pretty Muddy event is being held on October 1 – it’s a 5k obstacle course with added mud. Danielle Glavin, Cancer Research UK spokesperson for the East Midlands, said: “Natasha’s story shows why we need women of all shapes and sizes to pull on their leggings, lace up their trainers and show their support. Money raised through Race for Life allows Cancer Research UK’s doctors, nurses and scientists to advance research which is helping to save the lives of men, women and children across the East Midlands. Sign up for the Lincoln Race for Life here.